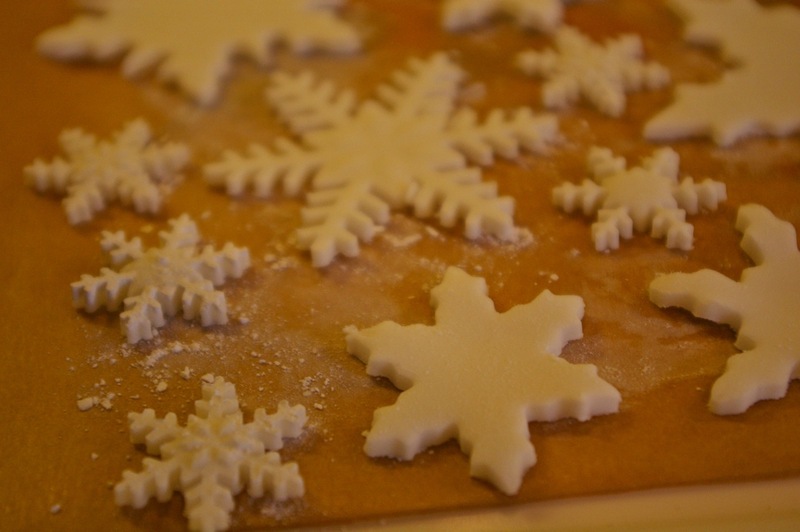 Christmas preparations: sugar and spice and all things nice! Here in chilly Bath it is full steam ahead with my Christmas preparations. Our Christmas concert is next Saturday (Bath Minerva Choir) and it is starting to sound pretty good...if I do say so myself. As it was our final Saturday morning rehearsal, I made a gingerbread house for the weekly fundraising raffle. Our choirmaster decided to auction it instead and I was chuffed by the response. I guess people don't realise how easy it is to make a gingerbread house! I have been making up batches of gingerbread dough as it keeps well in the fridge and can be frozen, and I love the scent that permeates the house. 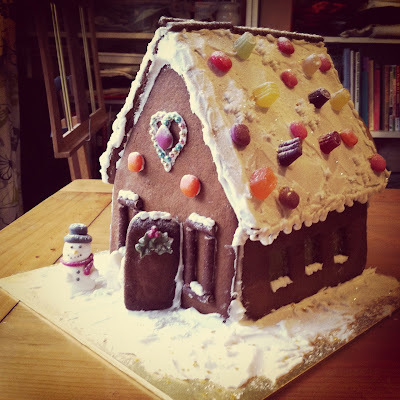 I have two more gingerbread houses to make, some gingerbread dala horses and some two-dimensional houses (tall ones like you get in Bruges or Amsterdam) to stand on top of the next batch of Christmas cakes, with a candle in the middle to shine light through the windows. 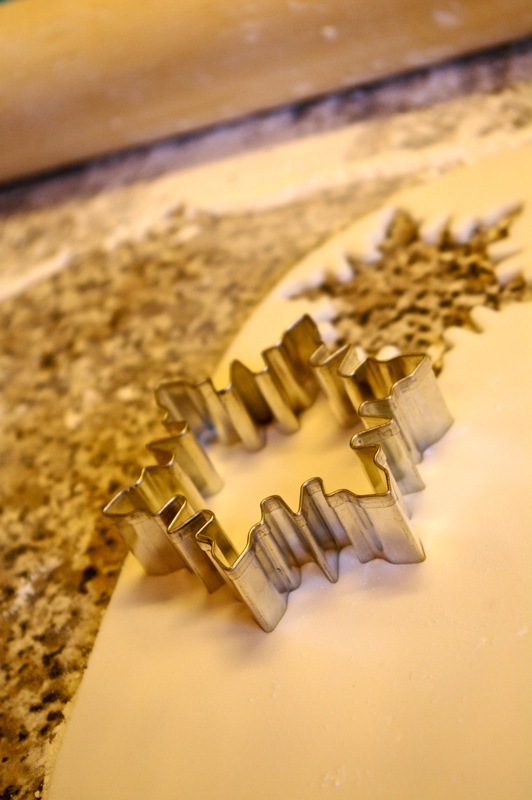 I may also make some bauble cookies to ice and decorate. Talking of delicious scents, I have a batch of spiced berry rum I have to stir every day - and lick the spoon afterwards (it's a tough job, but someone's got to do it!). 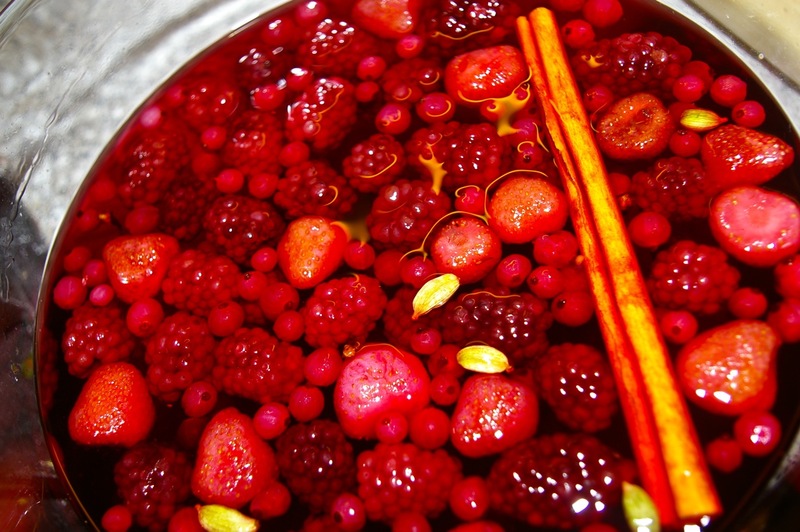 I have made raspberry vodka before, but this is already far superior. It smells like Heaven and tastes amazing...it looks pretty too. The Christmas cakes have taken some planning, not least because one of them has to be nut-free so has to be handled first, before I start rolling out marzipan. Actually, I think I am toning up my arms with all this rolling out of gingerbread and marzipan and fondant icing! Each time I roll out fondant and have some left, I cut out snowflakes to use in the decoration. 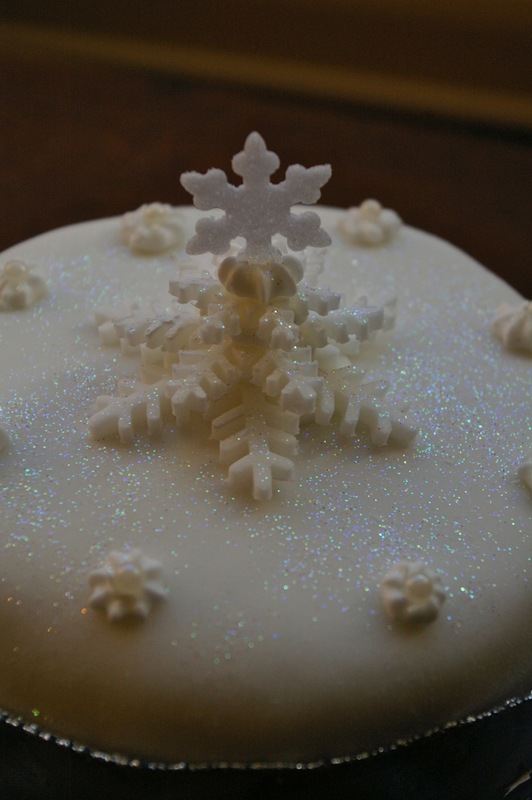 I love simple designs, all white and glittery, although my most requested Christmas cake is always the penguin slide (I'll post a photo a bit further on). As I mentioned, my most requested cake is the penguin slide (or slider, as they say in this part of England). I cut a spiral around the edge of the cake before I marzipan and ice it. 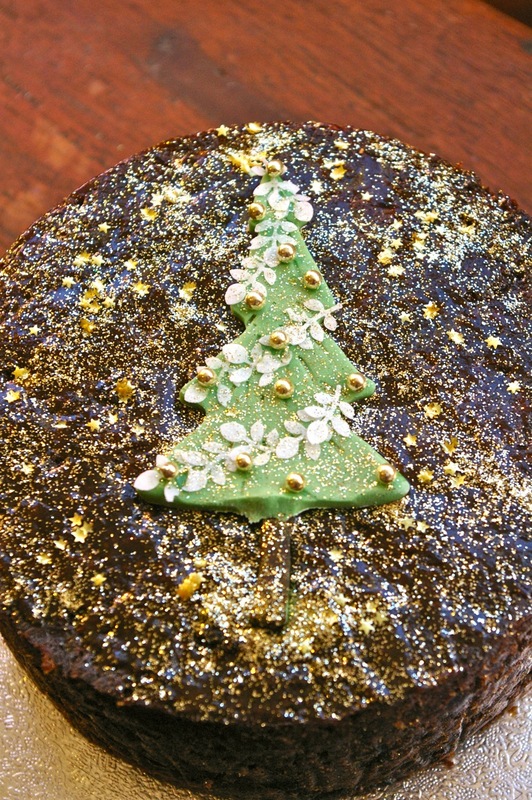 The difficulty with this particular cake was over-feeding, as is common this time of year! I have mainly been feeding cakes with ginger wine but this one had had a weekly drop of Jack Daniels...to the point it was starting to seep out of the base of the cake...oops; just keep it away from naked flames! 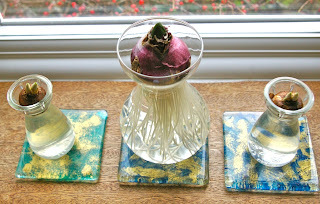 It made cutting away the slide a bit tricky - and made the offcuts all the more tempting! I leave the marzipan to dry out for 24 hours and then cover the cake with white fondant icing. I made an igloo by covering an egg cup with cling-film and then fondant, scoring it, adding a door way and letting it harden and dry out. In the meantime I made penguins from fondant icing, attempting to give each a different pose and character. 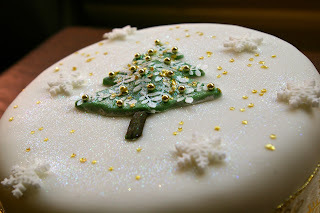 Then I just stuck them in place with royal icing and dusted the whole cake liberally with white edible glitter (the Craft Company sells extra large pots - and lots of other tempting goodies). The result is generally pretty well received - Lesley certainly seemed happy with this one! Two of my colleagues at work asked me to make Christmas cakes for them and left it to me to choose the design, so I am really hoping Nic and Sue will like these! I was inspired by Alan Dunn's "Christmas Cakes" book to use leaf cutters with edible rice paper. I could not get hold of the cutter he used, but found something I hope is still effective. I like the simplicity of these cakes and would choose something like this for myself, but hope my colleagues are not expecting something more whizz bang. 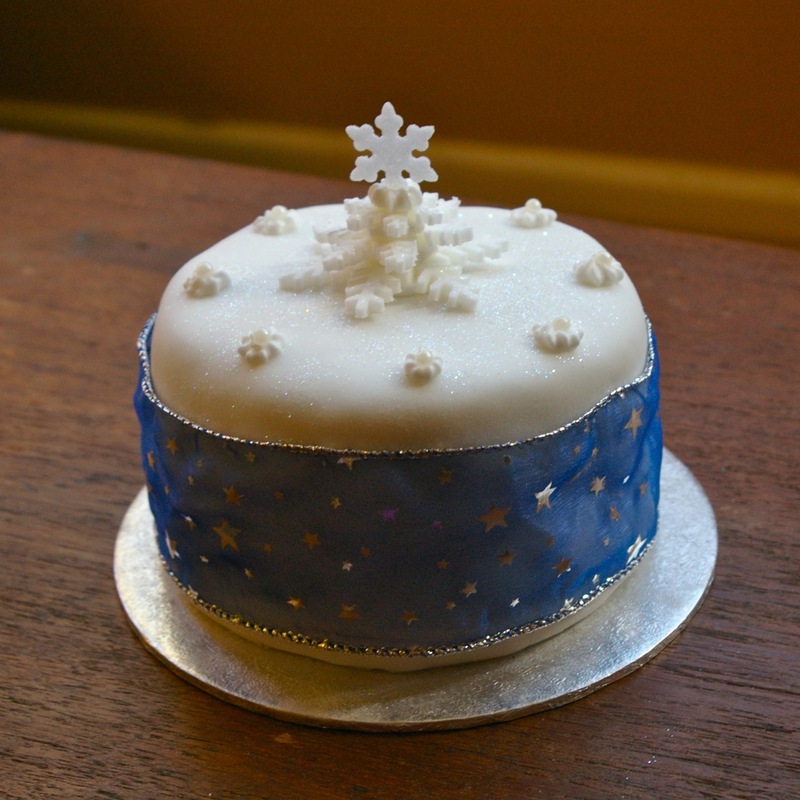 I also made a small cake for my lovely Aunt Anne (with whom we had lunch today). 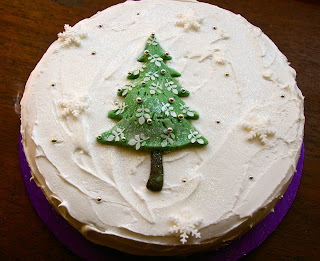 I used fondant snowflakes, stacked up to look a bit like a Christmas tree. For such a small cake the decoration had to be in proportion. 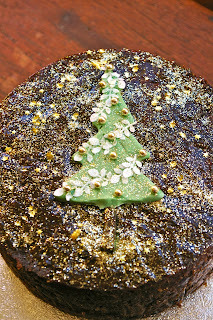 My mother is borderline diabetic, but assures me she is allowed fruit cake as long as there is not too much marzipan and icing, so I skipped the marzipan and fondant layers on this one and just added the fondant tree and dusting of edible gold glitter and stars. I have the day off work tomorrow, so I think I will walk in to town to pick up the last few Christmas things (and a replacement rolling pin as I dented mine crushing boiled sweets to melt as glass in the gingerbread house windows!) 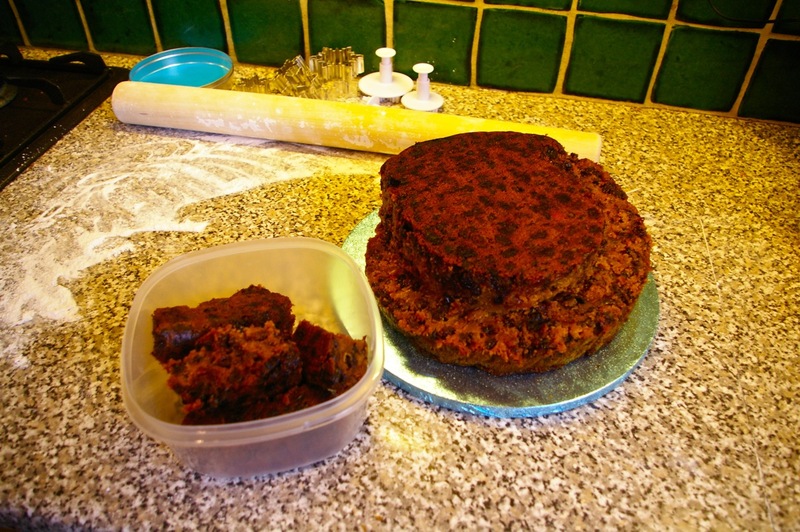 and then make some mulling syrup and ice my Dutch houses for the last few Christmas cakes. If that all gets done in time, I may just have to watch It's A wonderful Life and write my Christmas cards. You know, you really ought to give classes in cake-making - they are absolutely fabulous! 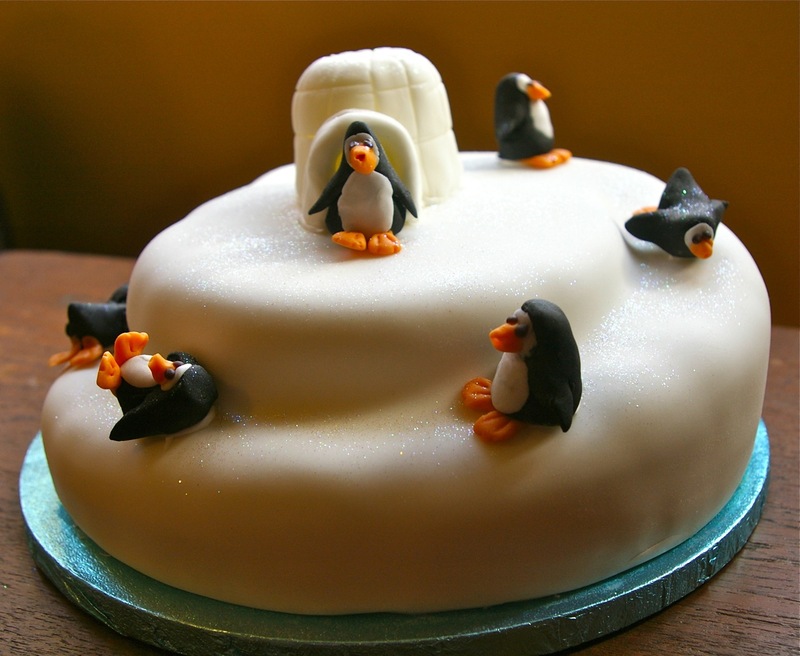 The penguin cake is adorable - but my favourite is Aunt Anne's, it so beautiful! I am thinking that next year I might have to give a proper English Christmas cake a go - I guess it's too late now? There are alternatives to making the cake early and 'feeding' it - you can boil the fruit for an instantly rich and moist cake. 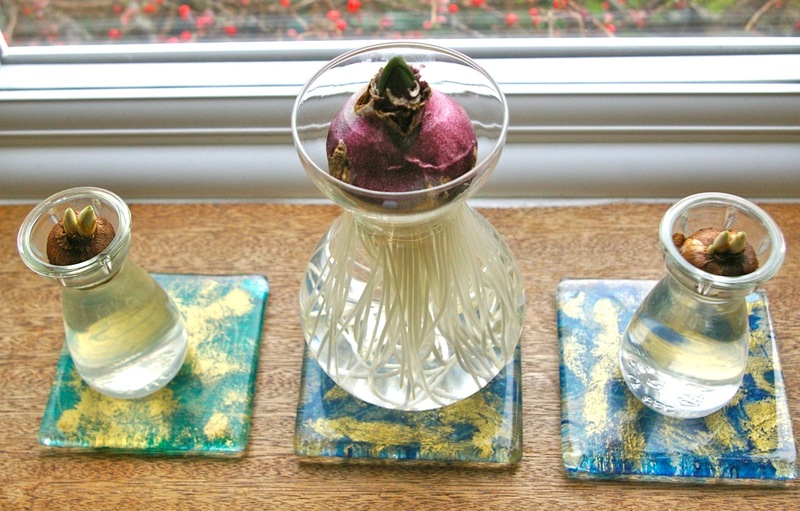 I will email the recipe to you this evening, in case you decide to give it a go this year. I'd love a recipe! I am not sure whether I will have time or not this year, but I'd love to give a try. ta da! recipes provided - let me know if you have any questions.